What do I say about this recipe, how do I describe this dish. This was perfect, this was delicious, it was delicate, it was an experience. Every bite you have is a wow moment bite, it is the perfect balance of flavours. You taste everything that is in it, but nothing overpowers anything. I have had mud crabs before, but this is my first time putting it into a pasta. After looking for a recipe to try, I found this one, it was easy, it looked like I would enjoy it and boy did I pick right. This was my first time at 'putting a crab to sleep', I have to say I didn't love the thought of doing that, so I made my husband do that as he loves fishing, so he is okay with that. But sorry crab, it will happen again as my goodness I enjoyed this dish. I looked at a few recipes on how to cook a crab and I stuck with this one, it was cooked perfectly. You need to have a saucepan that is large enough to fit the crab into it. Cleaning the crab was an experience, me and my husband stood side by side picking out all the meat out of the crabs. You can buy fresh crab meat already cleaned, you will need about 400g, but this had to be done, at least this time, it was time consuming, but nice. Now I did get a few small shell pieces into my pasta, as it is really hard not to, but as I am not a restaurant, we didn't really care, and no piece was big enough to get all dramatic on TV food shows that you would crack a tooth. So take your time doing this part, if you don't want crab shell in your pasta. When cleaning the crab, you will need crab picks and crab crackers. Try not to over pick it, try and get a few bigger pieces of crab, especially from the claws. 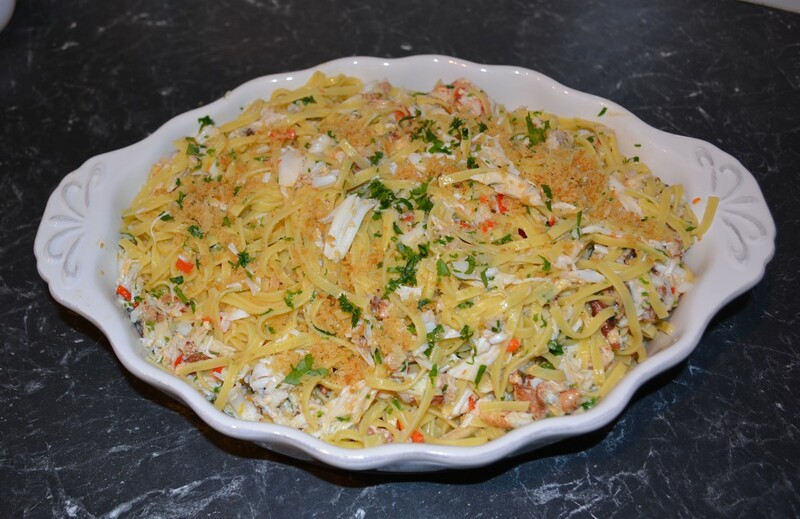 While cleaning the crab, the claws can have liquid in it, cooking water, don't discard it, pour it into a bowl, taste it, if it isn't too salty, add it to the pasta when you add the crab meat, add it like you would pasta water. For the pasta, I used a thin fettuccine, but you can use spaghettini or spaghetti, if you prefer. I made the recipe using 2 live mud crabs, so you can see a lot of crab in the dish, expect less if you use one, but one is enough for the dish to taste great. We purchased both a male and female crab, that is why we had two, to see which was better. We preferred the male, as it had more meat. The female had roe, but we really didn't love it. 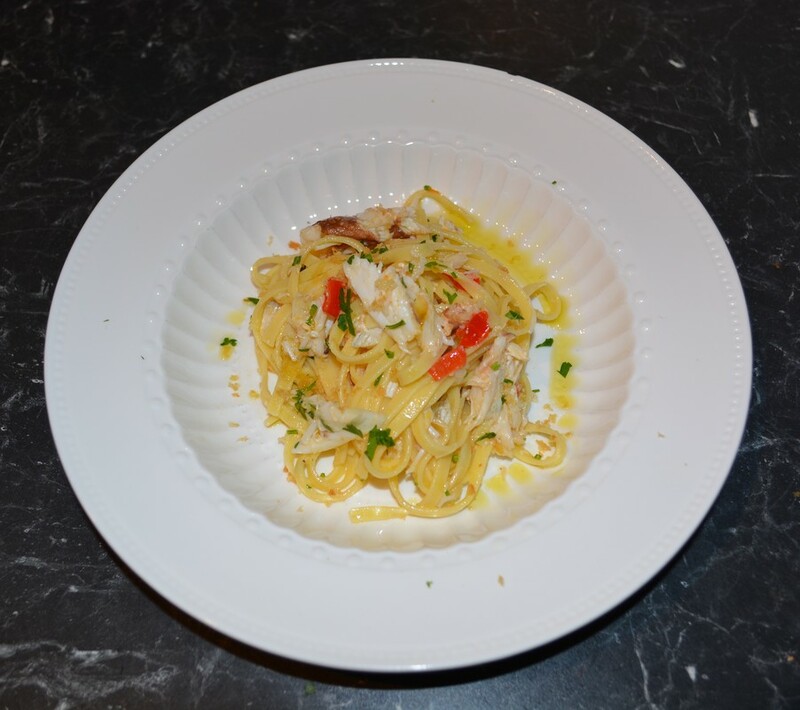 As I used two crabs, I also used 500g thin fettuccine, and it was lovely. This was not the cheapest dish I'd ever eaten, but by making it at home for a family of 5 it was far cheaper than going to a restaurant and having it. So if you love crab pasta, you do need to try this. Heat 40ml of the extra virgin olive oil in a frying pan over low heat. Add garlic and chilli and saute until tender (5-6 minutes). Season to taste, add lemon rind and another 90ml of the extra virgin olive oil, set aside to infuse (1-2 hours). Meanwhile, place the live crabs in the freezer for 30 minutes, to put them to sleep. Cook pasta in boiling salted water until al dente. Follow packet instructions, but check 1-2 minutes before suggested time, to make sure it is al dente. Meanwhile, taost panko crumbs in remaining 10ml of extra virgin olive oil in a small frying pan over medium-high heat until golden (3-4 minutes). Drain on absorbent paper. Gently heat the infused oil over low heat. Drain pasta (reserve 50ml of pasta water) and return pasta to pan with reserved pasta water, butter and infused oil, stir well and season to taste. You can add the crab claw liquid here, if using. Add crab meat, parsley and lemon juice, cover and stand until crab is warmed through (1-2 minutes). Toss to combine and serve hot, scattered with panko crumbs.